In stock -This product will ship today if ordered within the next 8 hours and 30 minutes. Cleanmarine MenoMin for women, regulates hormonal activity, maintains normal mucous membranes, reduces tiredness and fatigue, and doesn`t repeat like fish oils. 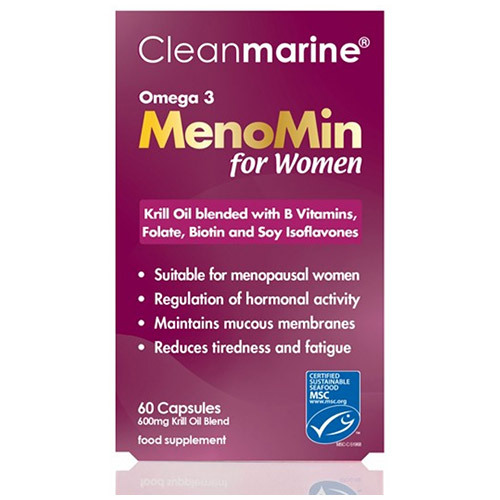 Introducing Cleanmarine MenoMin for women. Each small but mighty capsule is packed with super absorbing omega 3 phospholipids plus folate, biotin, B vitamins and soy isoflavones. This synergistic combination is ideal for menopausal women, helping to regulate hormonal activity, maintain normal mucous membranes, as well as reduce tiredness and fatigue. So, don’t pause for menopause. Let Cleanmarine MenoMin for women keep you feeling and looking at your best, every day. Euphausia superba 350mg (Krill Oil, 42%, Crustacean), softgel capsule (fish gelatine, glycerine, sorbitol, ferrous oxide), MCT Oil, Rosemary Extract, Soy Isoflavones*, Beeswax, Soy Lecithin*, Ethylvanillin (Flavouring), Pyridoxinehydrochloride (Vit B6), Thiamine mononitrate(Vit B1), Riboflavin (Vit B2), Folic Acid, Biotin, Cholecalciferol (Vit D3) and Vitamin B12. * Non-genetically modified. Recommended use: take two capsules a day. Consult a health practitioner prior to use if you are taking medications, pregnant or breastfeeding. Below are reviews of Cleanmarine MenoMin for Women - 60 x 600mg Capsules by bodykind customers. If you have tried this product we'd love to hear what you think so please leave a review. Excellent customer service! Prompt delivery! Very pleased with product!! Tried many other menopause remedies but this seems to help! 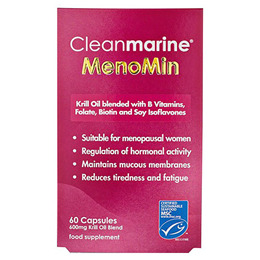 I started taking Cleanmarine Menomin over a week ago and already I feel my menopause symptoms have alleviated, I have tried many other menopause suggested vitamins, but nothing has worked! So very pleased with Menomin and would recommend trying! Bodykind were swift, with excellent customer service highly recommend! Very impressed with this supplement, no fishy aftertaste at all and and great to have it delivered in a small capsule. I bought it because it supports my system with more than one supplement in an easy to take format. I feel that my normal cycle was made more comfortable using this product. I was just about to purchase my second pack when I received an invitation to leave a review. I have recommended this product to my friends as I am truly impressed with it.